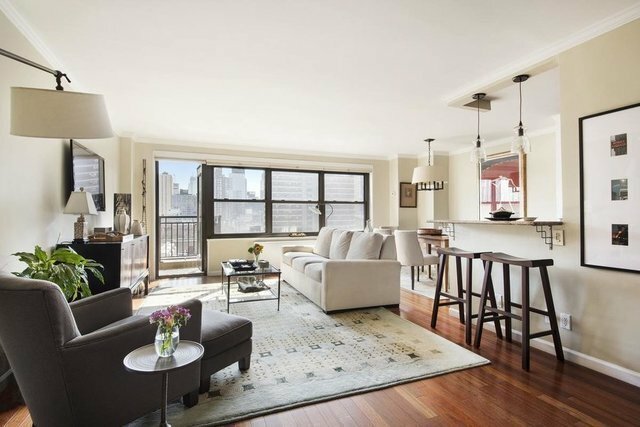 Bring your sunglasses to this fully renovated and impeccably maintained spacious two bedroom/two bath home. This sun-splashed upgraded apartment features six (6) completely outfitted enormous closets, beautiful flooring throughout and a wall of south facing windows.This bright, corner residence has an open living/dining room that offers magnificent city views, a peek of the Hudson River, and picturesque sunsets.The generously proportioned living room offers plentiful space, and a separate windowed dining area. This home is the perfect place for easy entertaining and relaxing both inside and outside. Your very own large private 27-foot balcony is the ideal setting for morning coffee or dining al fresco. An expanded open kitchen has a granite breakfast bar, upgraded appliances including a wine refrigerator and stainless appliances plus stylish pendant lights. The large and gracious corner master suite can comfortably fit a king-sized bed and has its own windowed en-suite luxurious bath. A second comfortable bedroom offers a walk-in closet with an east facing large window overlooking greenery.142 West End Avenue is well run co-op with a wonderful staff, gym, playroom, bike room, laundry room and circular driveway. 142 WEA is situated in the Lincoln Towers Community surrounded by beautifully manicured gardens and a five (5) acre park. Live in the epicenter of Lincoln Center near the greatest cultural, dining, shopping, and entertainment plus a plethora of transportation options. Utilities included in maintenance. 70% financing allowed. Capital Contribution $136.25.